Divided into four parts, Programmable Automation Technologies focuses on processes and systems used in industry. Comprehensive yet concise, this unique textbook provides a solid foundation of analytical techniques to justify automation. It provides the knowledge and instruction on how to program computer numerical controlled (CNC) equipment, industrial robots and programmable logic controllers (PLCs). Through a very practical approach, readers will learn specific programming languages related to each technology, including G code and ladder logic. And Programmable Automation Technologies is sure to be found useful by electrical, industrial, mechanical and manufacturing engineering technology undergraduate students. 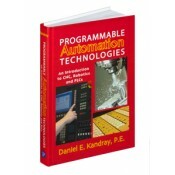 The rich and detailed introductory text will also appeal to anyone in industry interested in learning about programmable automation and developing the corresponding programming skills. • Each chapter begins with an overview of the topic with emphasis on desired outcomes and concludes with a summary, questions, and problems where appropriate. • Presents explicit skills and methodologies to aid in the programming process. • Features strong examples with numerous illustrations. • Uses computer simulation and actual lab equipment extensively in learning activities.